Internet of things is the new buzz in the world of technology. Businesses are now keen to leverage this wave of technology to their advantage. The software as a service model is enabling the internet of things to develop applications that are powering businesses. The data from devices is collected, analysed and used to trigger business decisions. The smart devices, sensors, cloud networks & intelligent softwares are driving the IoT wave. IoT applications are all pervasive. Whether it is applications for personal use, business decisions, asset monitoring, public infrastructure or managing home from your mobiles, IoT makes these possible. Here is a look at some of the applications of Internet of things that can shape the future and create an impact in the world. The data generated from mobile devices and users who buy things from different sites can be stored by companies to do an analysis of buying patterns. Location based discounts based on user behavioural patterns can be displayed for marketing commodities. The data from the mobile devices of users can be stored, analysed and used to generate the marketing offers for best outcomes. The growth of devices like smart warbles, it is easier to track the movement of people & their behaviours. These devices can help in collecting valuable data to analyse the activity of individuals. The patients can be monitored better using these devices, automatic actionable insights can be sent to people. For e.g. medication alerts, activity signals can be sent to patients through these automated equipments and apps. With the growing competition from various electronic & digital enterprises, banking sector is receiving several challenges. A lot of them are looking to adopt disruptive technologies to improvise their existing processes. The bad loans for banks remain a severe challenge. The banks can locate the assets against for which loans have been disbursed. They can also track impairments of assets like Motor Vehicles, agricultural and other types of assets. When the value of collateral falls below the recoverable loan amount for any customer, the alerts can be sent to banks. This can also be highlighted on the GPS maps where banks can track the loan status, defaulters, recoverable loan amounts etc. 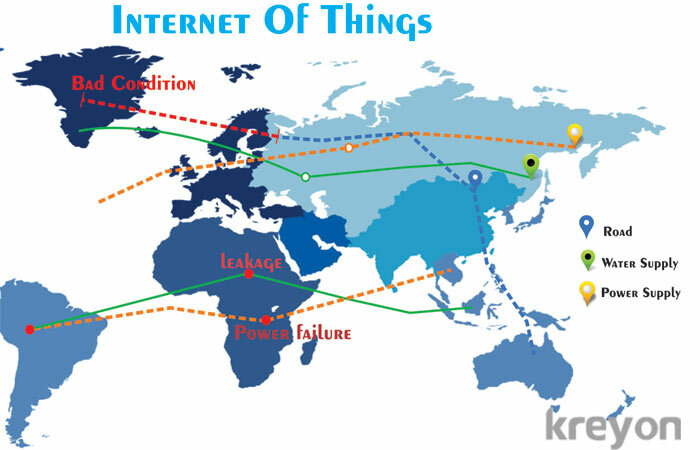 The internet of things is an interconnected system which can represent the assets for an organisation. The assets can be represented on maps. The assets are tagged and can be tracked. The alerts can be issued when the assets are missing. The realtime verification and monitoring of health status of assets can be done with sensor devices connected to a centralised system. The sales persons of a company move about trying to cover maximum ground for making sales. The routes to potential opportunities can be maximised with location based apps connected to CRM systems. The movements of sales persons can be tracked and optimised for best returns. The GPS maps will provide realtime status and information of sales person’s whereabouts and details. The trips can be optimised based on probabilistic patterns and locations to maximise chances of closing deals. The condition of roads for public utilities can be marked using apps. The patches of roads which are in bad condition can be highlighted with GIS information patterns. The road condition can be analysed and tracked using this GIS information. Municipalities can use these tools to evaluate the road patterns in their regions and create plans according to realtime condition of roads. The overall percentage of road networks which needs repair & maintenance etc can also be highlighted on the GIS Maps. Power Supply failures are detrimental to development & business activities. They are critical to address with immediate alerts and notifications. The IoT apps can be used to track power failures with remote sensors. The regions where power failure has occurred can be tracked & highlighted on the map. The downtime analysis and locations with highest downtime can be tracked from the GIS maps. With IoT devices, the realtime inventory status of items can be tracked. The consumption status of items can also be looked into. The procurement is driven by demand of the commodities; slow moving items are not purchased in bulk quantity. The usage patterns are generated based on realtime consumption status of entities. The maintenance triggers of machines & equipments can be generated using sensor devices. The usage logs, condition status signals can be used to determine the predictive maintenance for machines, equipments and vehicles for an organisation. These alerts can be sent to the respective asset owners for creating a preventive maintenance schedule for assets. Scheduling maintenance and repair activities efficiently can be done with self service indicators connected to centralised systems. Water leakage can be hazardous for public utilities. Tracking water leakages and supply disorders at the earliest remains high on priority for them. IoT can enable tracking the leakages and shortcomings in distribution of water supply by using location based mapping of water pipelines. The leakages can be marked on the maps and notification alerts can be sent to respective authorities for faster troubleshooting. IoT is fast gaining prominence and becoming a technological revolution. The realtime and automated collection of data from devices around us, which generate contextual insights, are making things more intelligent than ever before. The machines are becoming smarter and helping the users to take context based actions. The times ahead will be fascinating to watch as more & more applications around Internet of things will emerge to drive the future.